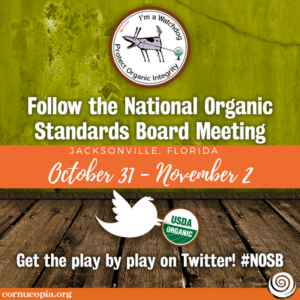 Join The Cornucopia Institute as we live tweet from the National Organic Standards Board meeting in Jacksonville, Florida. We will be sharing the play by play with our Twitter followers under #NOSB or simply follow our stream. 3:12PM CT: The fall 2017 NOSB meeting is adjourned. 3:04PM CT: Francis Thicke retires from the NOSB with a standing ovation. 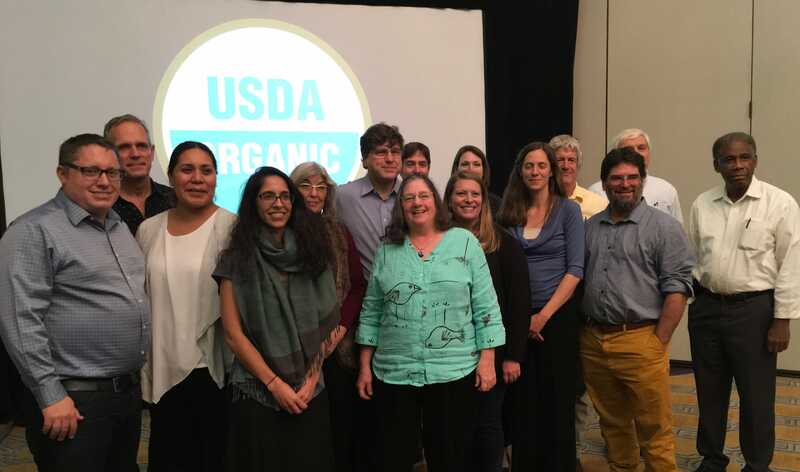 As a highly respected soil scientist, organic dairy farmer, and former employee of the USDA, he brought a unique perspective to the NOSB in his role as an environmental representative on the board. He was a mentor for many fellow NOSB members. In his closing remarks, he read the USDA the riot act, noting a lack of enforcement in giant factory livestock operations, imports, and hydroponics. Thicke also bemoaned the corporate influence on the NOSB. He promoted the creation of an add-on label to the USDA organic seal, with greater protections, saying the organic seal is no longer the gold standard. 2:31PM CT: The NOSB unanimously passed the excluded methods proposal which details additional genetic engineering technologies that are prohibited from use in organic agricultural production. The techniques that were banned include cisgenesis, intragenesis, and agro-infiltration. The proposal lists additional technologies that should be defined under the excluded methods document in the future. 2:14PM CT: The NOSB has discussed its research priorities. Overall: The National Organic Standards Board requests that integrated research be undertaken with consideration of the whole farm system, recognizing the interplay of agroecology, the surrounding environment, and both native and farmed species of plants and animals. Evaluation of methionine in the context of a systems approach in organic poultry production. Prevention and management of parasites, examining breeds, geographical differences, alternative treatments, and pasture species. Organic livestock breeding for animals adapted to outdoor life and living vegetation. Examination of decomposition rates, the effects of residues on soil biology, and the factors that affect the breakdown of biodegradable biobased mulch film. Organic no-till practices for diverse climates, crops, and soil types. Alternatives to antibiotics (tetracycline and streptomycin) for fire blight control in apples and pears. Alternatives to copper for plant disease and algae control: development of disease-resistant varieties, and particular research on algae control in rice. Plant disease management through crop rotations, sanitation practices, plant spacing and disease-resistant varieties, and biopesticides. Mitigation measures for pesticide residues in compost, including identification of problematic feedstock. Management and control of spotted wing drosophila in fruits. Outcome of genetically engineered (GMO/GE) material in organic compost. Evaluation of public germplasm collections of at-risk crops for the presence of GE traits, and ways to mitigate small amounts of unwanted genetic material in breeding lines. Techniques for preventing adventitious presence of GE material in organic crops, and evaluation of the effectiveness of current prevention strategies. Comparison of alternatives to chlorine materials in processing: impact mitigation, best management practices, and potential for chlorine absorption by produce. Production of celery for celery powder yielding nitrates sufficient for cured meat applications, and investigation of agriculturally derived alternatives. 11:20AM CT: Casings, made from processed intestines of conventional animals, were re-approved for use in organic food. The primary reason for this allowance is the insufficient supply available from organic cows. 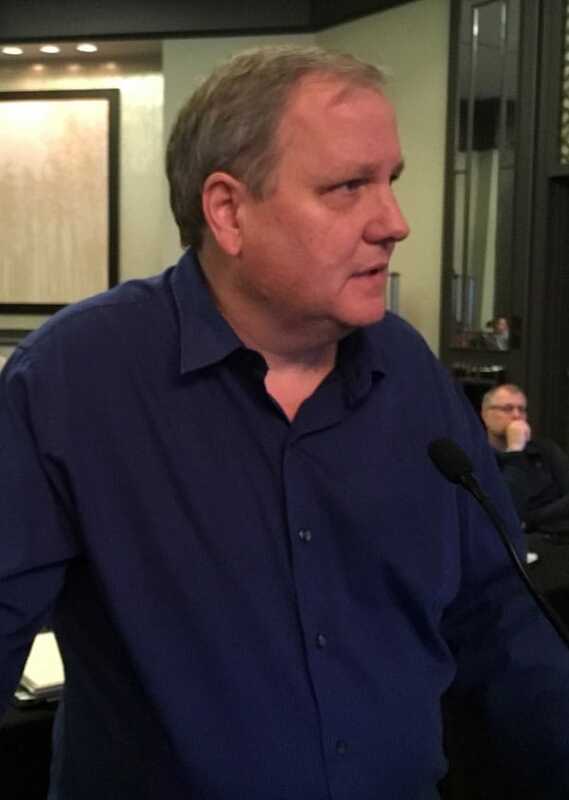 Dave Mortensen (scientist seat) was the only member voting to remove conventional casings from the National List, arguing that the consumption of GMO corn by conventional cattle was a problem. The need for more organic processing facilities was brought up so that organic animals can maintain their organic status. 11:02AM CT: NOSB votes 12-3 to continue allowed use of sodium phosphate in processed organic foods. Board members discussed the need for the additive, with points being raised about health concerns of too many phosphates in the diet and the European Union not allowing its use. 10:07AM CT: The NOSB approves a petition to allow use of sulfur in organic livestock agriculture for dusting to control pests. And a proposal to allow use of hypochlorous acid is unanimously rejected. 9:42AM CT: NOSB votes 14-1 to remove procaine from use in organics. (There was a 3-3 vote in the livestock subcommittee). There are claims that there are better drugs and this material is not needed. 9:21AM CT: The NOSB also unanimously approves continued use of lidocaine. 9:20AM CT: The NOSB unanimously votes to continue to allow in organic livestock agriculture use of tolazoline and copper sulfate (with some reservations expressed about its build-up in soil). 9:17AM CT: The NOSB votes on several Sunset materials, unanimously approving continued use in organics of chlorhexidine, chlorine materials, and glucose. The board unanimously votes to remove oxytocin from use. 8:58AM CT: The NOSB’s livestock subcommittee is now leading board discussion of materials up for review as part of the Sunset process. 8:46AM CT: NOSB board members are pressing the NOP’s Jennifer Tucker for answers on enforcement actions regarding imports. They are also reacting to the highly critical audit of the NOP’s handling of imports by the Office of Inspector General. 8:29AM CT: NOSB unanimously adopts a proposal it hopes will improve oversight of imports. 8:16AM CT: The NOSB has moved on to a discussion on how to close loopholes of “excluded operations in the supply chain.” Of specific concern are commodity brokers and others handling organic products without being certified. This is a huge issue swirling around fraudulent imports entering the U.S. as alleged organic grains and other commodities. 8:09AM CT: The NOSB votes unanimously to send the native ecosystems issue back to the subcommittee for additional work. 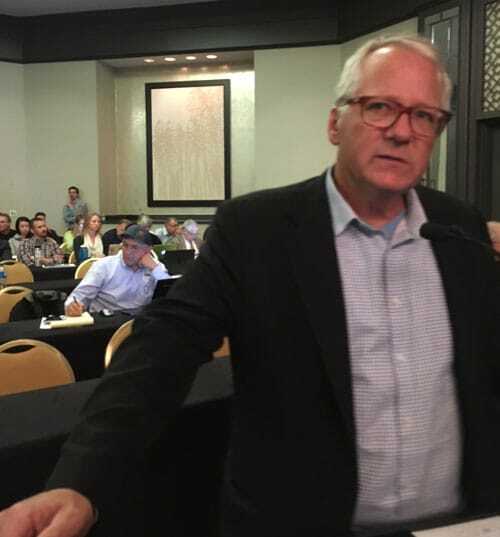 8:05AM CT: NOSB chair Tom Chapman (handler, Clif Bar) voices concerns during the discussion about defining protected lands and the qualifications of organic inspectors to carry out assessments related to native lands and ecosystems. 7:54AM CT: The NOSB meeting has resumed for its final day. The board is discussing artificial lighting in greenhouses and the use of recycled newspaper as mulch/weed control. Concerns are expressed about ink leaching into the soil. Next up, the debate over native ecosystems and issues related to their potential conversion to agricultural use. The meeting has now ended for the day. Motion to prohibit aeroponic production is passed, 14 for prohibiting it, one abstention. 5:31PM CT: Joelle Mosso (handler seat): I’m for transparency, let the market/consumers decide. Let the organic label be inclusive. Asa Bradman (environmental seat): I like a deeper compromise. There’s an opportunity to include everyone, a labeling compromise would be what I’m working for. Lisa de Lima (retailer seat): I would like a standard for all the types of production systems that resonate with consumers. I would like to see labeling. A-dae Romero Briones (consumer/public interest seat) : Indigenous communities believe in connectedness to the earth and our food. I want our community to be inclusive. 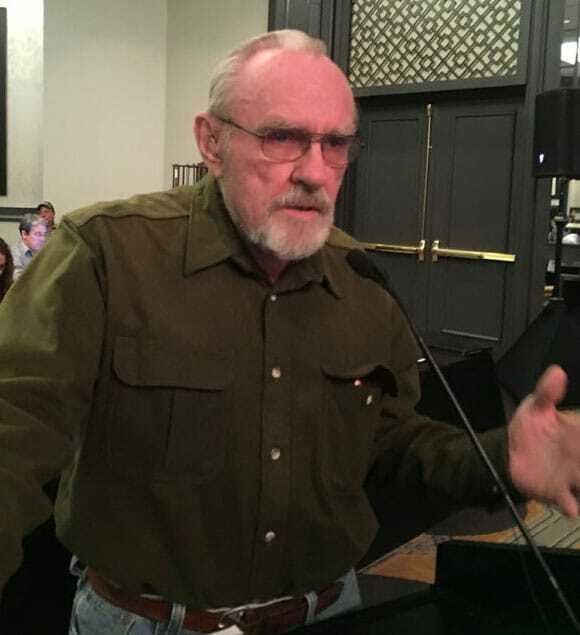 Francis Thicke (environmental seat and organic dairy farmer): This trophic level argument is bogus (requirement to have four trophic levels in a building put forward by the minority). I have a bird in my greenhouse, spiders, etc. but it doesn’t mean that those trophic levels are biodiverse. The CCOF proposal is business as usual – there is nothing close to compromise there. 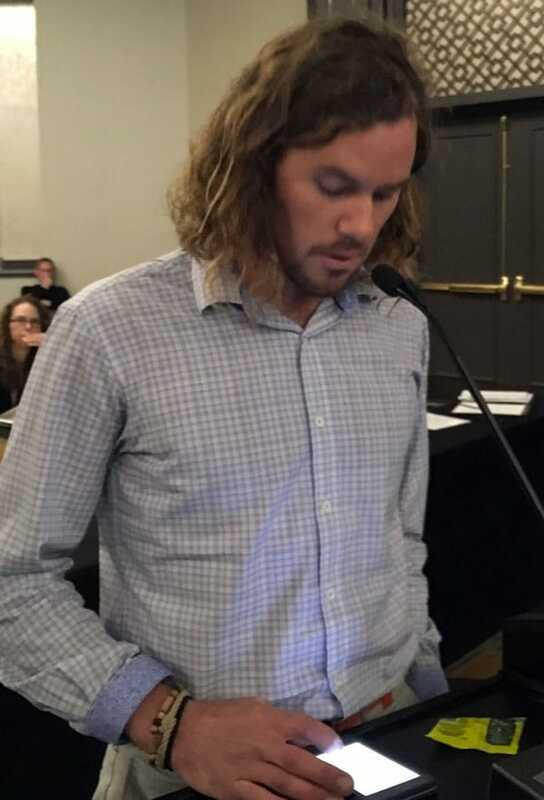 Tom Chapman (handler seat, Clif Bar): Disagrees with the crops subcommittee compromise proposal because “organic is so much more than inputs” yet this proposal is based on inputs. Ashley Swaffar: Would like to see a USDA organic for the two different systems as a compromise. Jesse Buie (farmer seat): We live in a capitalistic society. All of these systems will survive: hydroponics, aeroponics, container, aquaponic, and organic. Organic is separate from all of these things. The NOP should simply enforce the regulations, and that would solve all of our troubles. Dave Mortensen (scientist seat): As a scientist, he eloquently describes how container hydroponic agriculture defies co-evolution. There is no question in my mind that soil systems can sequester carbon on a much better scale than a hydroponic greenhouse tomato. The argument that biodiversity in the soil is the same as a container is silly. Steve Ela (farmer seat): I come at this from human hubris. With all of these new systems, there are unintended consequences. I look at it from the precautionary principle. I don’t believe we can redesign this system. I’m a soil scientist, and we cannot recreate a complex soil system. The more I farm, the more I understand that the longer I farm the less I know. I became an organic farmer not because of what I know, but because of what I don’t know. 4:40PM CT: Sue Baird (consumer/public interest seat): I love the soil. But I was taught when you write a law, despite language in a law, the judge considers the intent of the law. I believe there was an intent in the law to address hydroponic systems. I would like opportunities for inner city people. Scott Rice (certifier seat): CCOF provides a good way forward for this and we should use labeling to differentiate the systems under the organic label. 4:07PM CT: Joelle Mosso (handler seat, Olam Spices and Vegetable Ingredients) presented the minority view on the NOSB. The NOP has made statements allowing hydroponics over the years, and as a result, certification has happened, although not by all certifiers. The minority is not supportive of taking either hydroponic container proposal through to a vote at the fall 2017 NOSB meeting. Given the division of the community reflected in the division of the board, all stakeholders need to come to terms that a greater compromise will be necessary to make progress on this issue. The minority view finds merit in a discussion on hydroponic/soil-less production standards and mandatory additional labeling with the organic label/claim. This concept has not been fully explored. 3:55PM CT: As justification for the 20% liquid maximum in containers, it was explained that native soil organic matter will have about 10,000 lbs of nitrogen per acre, but most of it isn’t immediately readily available. Soils and some composts have the ability to cycle nitrogen in and out of root availability for the plant over a long period of time. Subcommittee vote, container production: Motion that for container production to be certified organic, a limit of 20% of the plants’ nitrogen requirement can be supplied by liquid feeding, and a limit of 50% of the plants’ nitrogen requirement can be added to the container after the crop has been planted. For perennials, the nitrogen feeding limit is calculated on an annual basis. Transplants, ornamentals, herbs, sprouts, fodder, and aquatic plants are exempted from these requirements. Subcommittee vote, hydroponics: Motion that any container production system that does not meet the standard of a limit of 20% of the plants’ nitrogen requirement being supplied by liquid feeding, and a limit of 50% of the plants’ nitrogen requirement being added to the container after the crop has been planted is defined as hydroponic and should not be allowed to be certified organic. For perennials, the nitrogen feeding limit is calculated on an annual basis. Transplants, ornamentals, herbs, sprouts, fodder, and aquatic plants are exempted from these requirements. 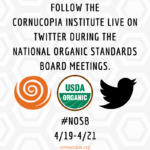 3:43PM CT: The NOSB began soliciting public comment in 2016 on how to strengthen the organic seed guidance, requiring the use of organic seed when it is available. The proposal was sent back to subcommittee for further work. 3:39PM CT: Cenergy USA, Inc. submitted a petition to establish a separate classification for anaerobic digestate derived from plant and animal products in a two stage mixed plugflow digester. The petition requests that anaerobic digestate materials not be classified as raw manure and therefore not be subject to pre-harvest delays. Anaerobic digestate fiber is currently used in horticultural products, crop production, and landscape applications as a soil amendment and fertilizer with the same restrictions required of raw manure, when used in organic production. The fiber is an ingredient in potting soils, is used in fertilizers, and serves as an alternative to peat moss in the commercial greenhouse industry. There was concern that the temperature used would not be sufficient to kill human pathogens in raw manure. 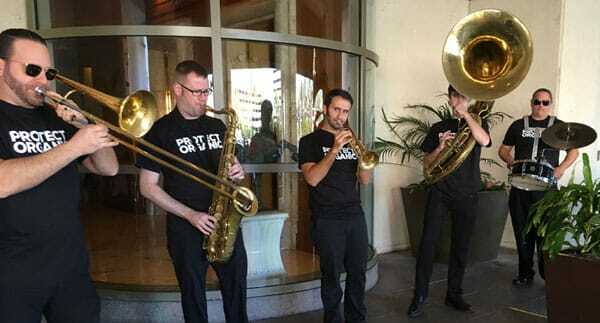 The petition was rejected by the NOSB. 3:29PM CT: Green Ag Supply, LLC has formally petitioned the National Organic Program for approval to use natural fatty alcohols for sucker control on organic crops. The material is currently only approved by the EPA for use in tobacco growing. The substance is a hormone that could be used to chemically remove flower buds as well as suckers preventing seed formation which then causes a plant to focus on leaf production. This is important for tobacco plants as they are sold by weight, so the heavier the leaves, the greater the profit. Since natural fatty alcohols act as a growth regulator and hormone, the material is not compatible with organic agriculture and was rejected by the NOSB. 2:08PM CT: The NOSB’s crops subcommittee finished their review of Sunset materials up for review by the full board. The board voted unanimously that chlorine materials remain on the National List, with the suggestion to add a review of all sanitizers to the work agenda. 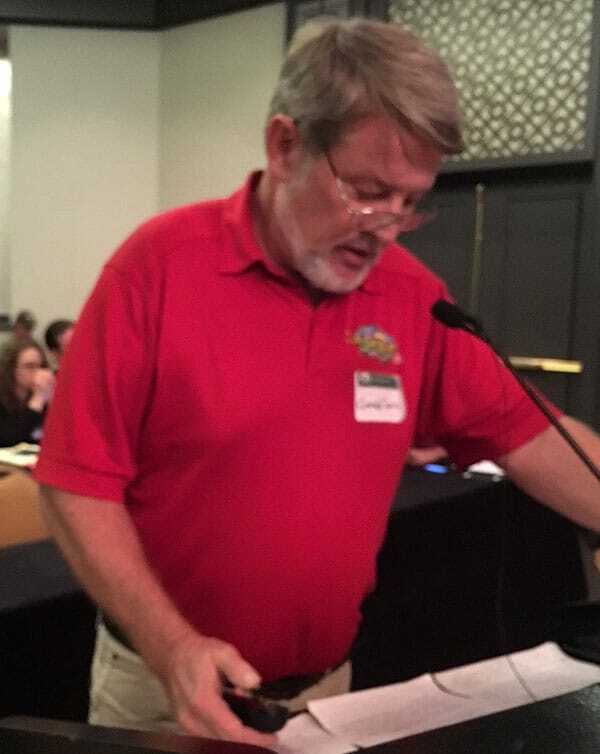 The board similarly voted to keep soap-based herbicides on the National List, with one NOSB member abstaining, given the concerns around the toxicity to both soil- and water-dwelling organisms. The NOSB voted unanimously to keep biodegradable biobased mulch film on the National List because paper mulch qualifies for 100% biobased mulch film, although there are no petroleum-based films that qualify. Any mulch not 100% biobased is expected to be removed at the end of the season. This concludes the public comments. Committee reports will follow. 1:45PM CT: Max Goldberg, organic advocate and operator of Living Maxwell, asks the NOSB: When it comes to containers, can certifiers inspect these systems? We have testimony from Bart Hall that it is not the case. Goldberg asks, “What happened to Aurora?” All we have heard is that it was closed. The lack of transparency of organic is troublesome, and organic integrity is suffering as a result. 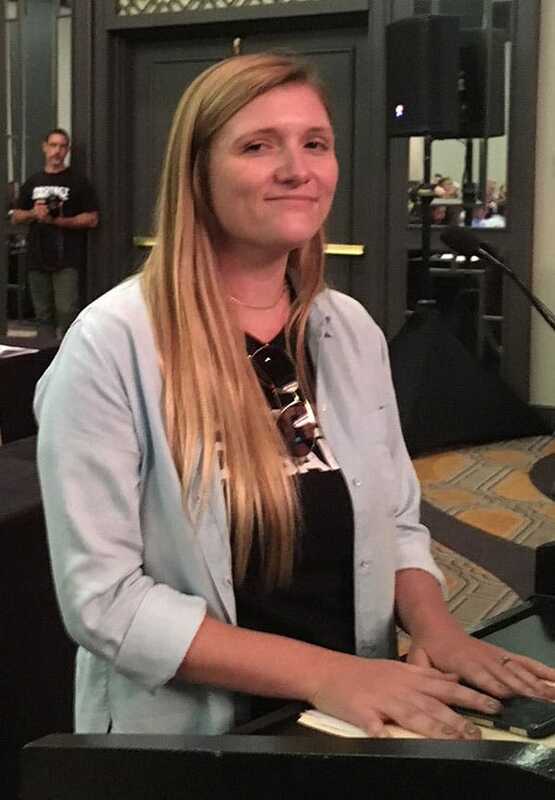 12:04PM CT: Gwendolyn Wyard of the Organic Trade Association said that members did not have time to respond to the NOSB within the comment period to engage with the NOSB on the three 2017 Sunset items up for review for continued use in organics. Instead, they worked around the NOSB and appealed to the political appointees at the USDA. NatureSweet is certified for organic tomato production in Mexico. 11:23AM CT: Andy Hudson, Westbridge Ag Products (a manufacturer of soap based herbicides), testified that their products should not be used on irrigation ditches because of the concern for harm to aquatic organisms. 11:12AM CT: John Bobbe, Director of the farmers’ marketing coop OFARM: The NOP is not on top of the fraudulent shipments that are coming into U.S. ports. International maritime laws should be looked at by the NOSB to help identify fraudulent imports – there is only one insurer, and they will insure at a conventional rate if it is conventional. Three weeks before The Washington Post article came out, the NOP denied that there was a problem. It is still taking busy farmers to get to the bottom of this – the NOP’s job. 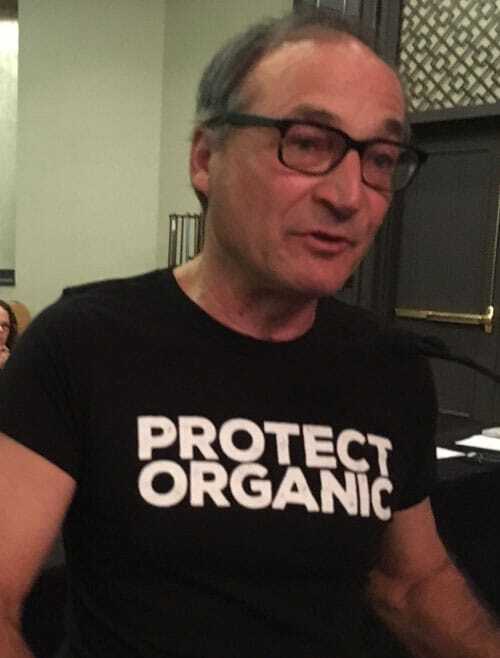 10:44AM CT: Lee Frankel of the hydroponic astroturf group Coalition for Sustainable Organics: There is a need for consistency under the organic label, why are mushrooms exempt? Why are microgreens exempt? 10:31AM CT: Ron Mitchell of Local Greens Farm. Says he is an organic hydroponic indoor vegetable grower. Uses kelp and artificial lights. Says they are close to zero carbon footprint. 10:20AM CT: Robert Rankin, International Food Additives Council (IFAC), supports konjak powder and sodium phosphates. Lori Klopf of ICL Food Specialties, and a member of the Food Additives Council, reports that they support phosphates for use in foods because it has unique qualities. 10:09AM CT: Colehour Bondera, coffee farmer and former NOSB member, asks that the allowed use of boric acid be continued in organics. We have a Hawaii outbreak of fire ants. Remember, he adds, no hydroponic operations were certified before the NOP said it was allowed – without the input of the NOSB. 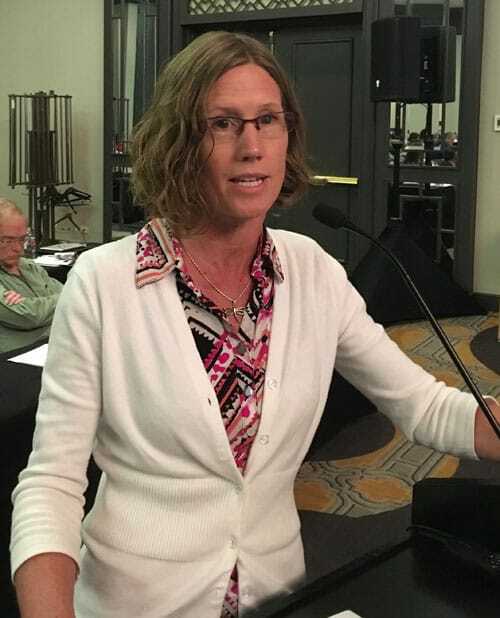 10:07AM CT: Suzanne McMillan of the ASPCA tells the NOSB that we cannot afford to wait anymore for the NOP to move forward on the Organic Livestock Poultry Practices proposed rule. 9:54AM CT: Julia Barton of Ohio Ecological Food and Farming Association (OEFFA) says they appreciate the discussion around fracking wastewater and its potential use in irrigation. She adds that the foundation of organic farming is in the soil. In the absence of clear standards, she says OEFFA has not certified hydroponic operations. 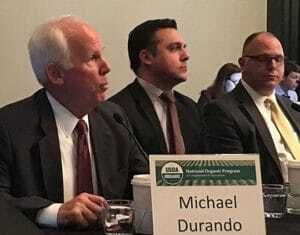 They support the Crops Subcommittee container compromise because it is truly a compromise. 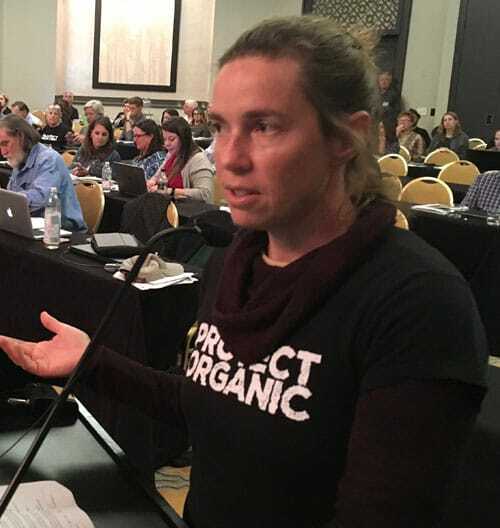 9:39AM CT: Abby Youngblood of the National Organic Coalition says she supports the NOSB’s Crops Subcommittee container compromise because it conforms with the original intent of OFPA to rely on natural processes for fertility rather than outside liquid input. 9:21AM CT: CCOF’s Kelly Damewood tells the NOSB that all container production is hydroponic production, all hydroponic production is container production. She says to leave it up to the producer to define whether they are container or hydroponically grown – they can pick one. 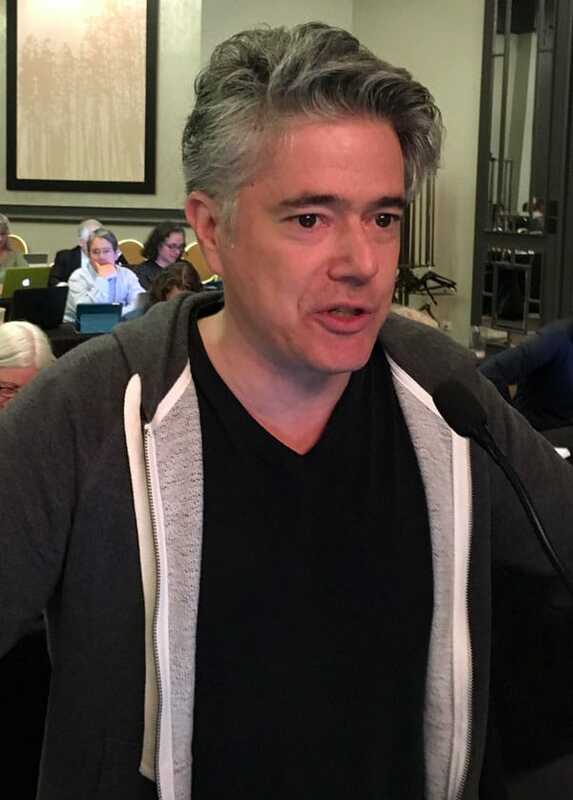 9:20AM CT: Cameron Harsh, for the Center for Food Safety, says the organization supports the NOSB compromise requiring a maximum of 20% of the crops fertility requirements be applied in a liquid form. 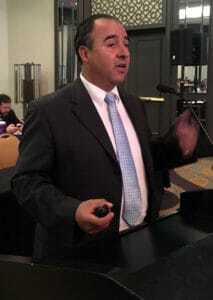 He says that they want to add a three-year wait period for container production systems in compliance to level the playing field for organic soil growers. 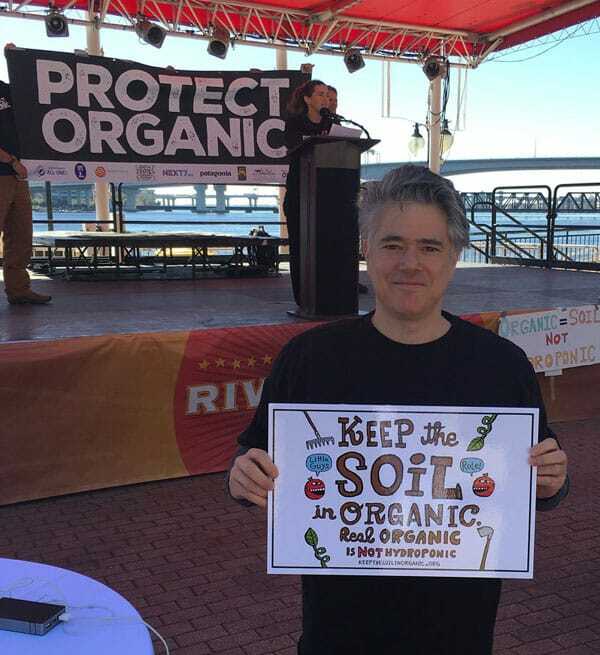 9:12AM CT: Pat Kerrigan, representing the Organic Consumers Association, speaks out for organic integrity. 8:48AM CT: Phil LaRocca, organic winemaker and president of the certifier CCOF, says CCOF has 108 farmers that are certified hydroponic organic. We will devastate them economically if we decertify them. I spent the first 25 years of my life developing my soil so I totally believe in that. The compromise came on our CCOF board when we started talking about labeling. 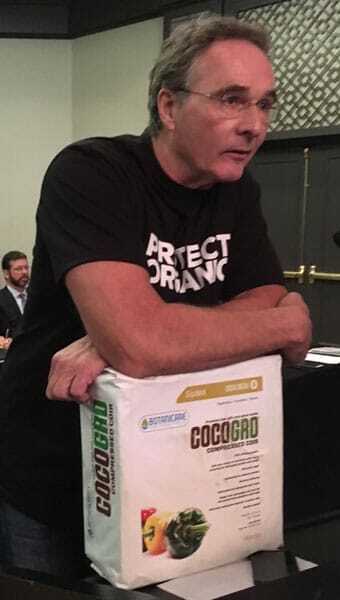 8:32AM CT: Jay Feldman, Executive Director of Beyond Pesticides and former NOSB member: The Board must ensure that there is public trust in that label. Not everything can be labeled as organic. Government waits to put out the fires. The NOSB must seek to avoid fires by knowing the issues before organic and proactively getting out in front of them. Organic will shrink if we wait until newspaper stories of fraud appear. 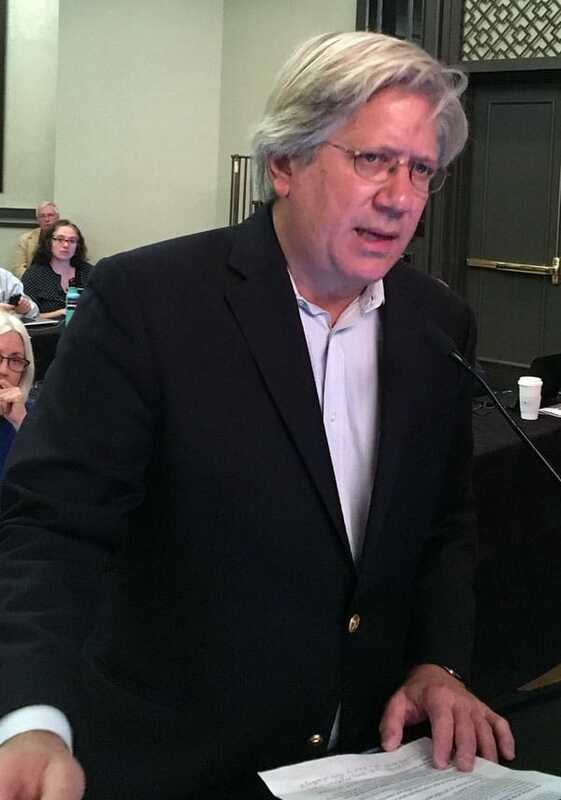 8:24AM CT: Public comment resumes at the NOSB meeting in Jacksonville, FL. The meeting will resume tomorrow morning. 6:37PM CT: Karl Hammer of Vermont Compost Company, a compost seller to containers and soil growers: A plant in the soil needs much less compost than a plant in containers. 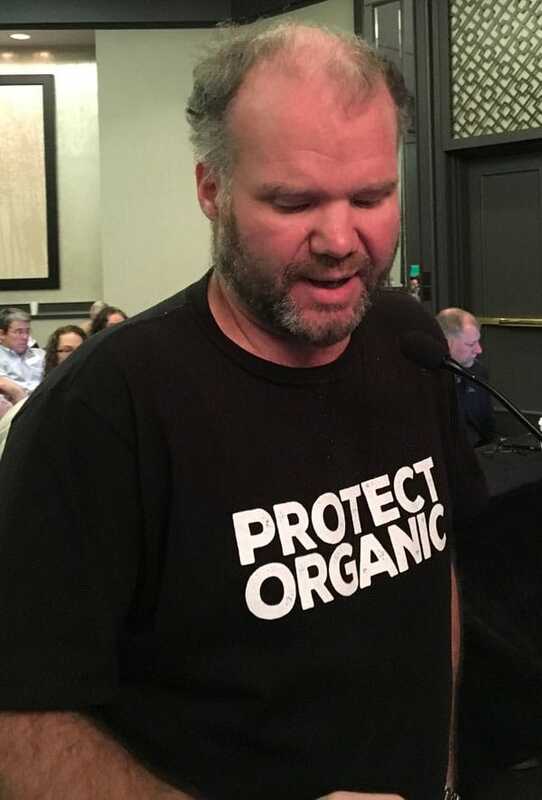 4:50PM CT: When asked if he was in support of the container compromise, Michael Brownback, 300-acre CSA vegetable farmer said, “There is a time for compromise, but now is the time for mother earth.” This was his first testimony before the NOSB since the mid-90s. The soil issue brought him here. 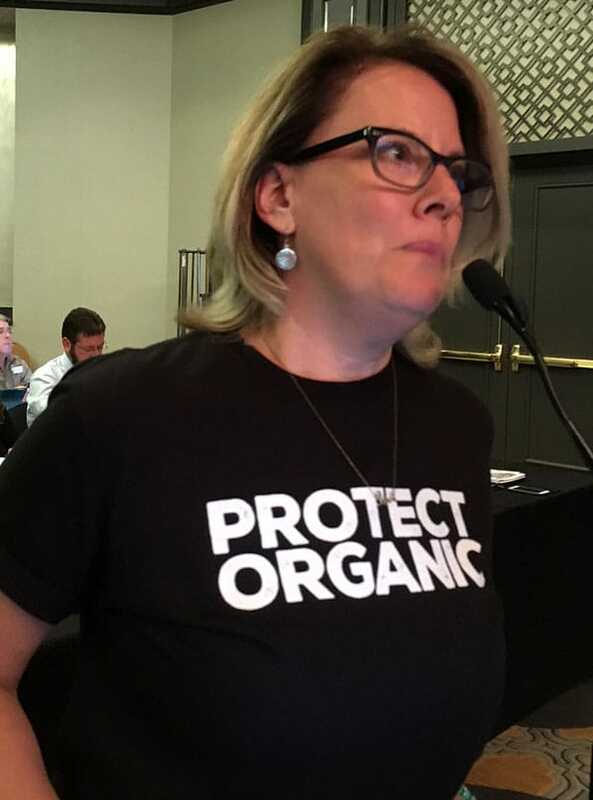 4:38PM CT: Lisa Stokke presented a petition signed by 86,269 people who have joined farmers to say to the NOSB: Protect the integrity of the organic label by voting no to keep hydroponics in organic! 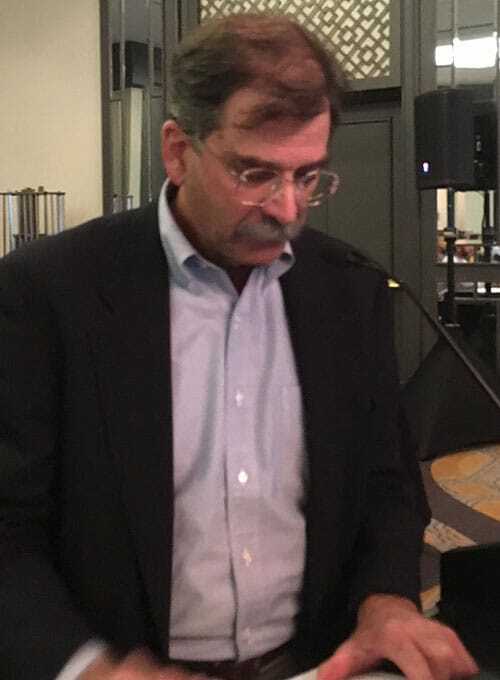 4:32PM CT: Giant container grower Wholesum Harvest’s Theo Crisantes says he is not in favor of the container production standard compromise put forth by the NOSB crops subcommittee. He opposes because of the 20% limit on applying liquid nitrogen, which he says is not inline with the way Wholesum produces products in containers. 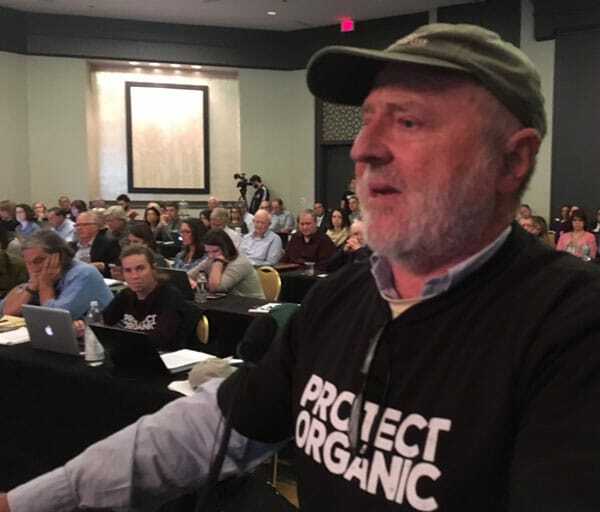 4:31PM CT: Jim Crawford, longtime organic farmer, owner of New Morning Farm, and Cornucopia board member argues for the enforcement of Organic Foods Production Act and the EU standards which require in the soil in the ground. 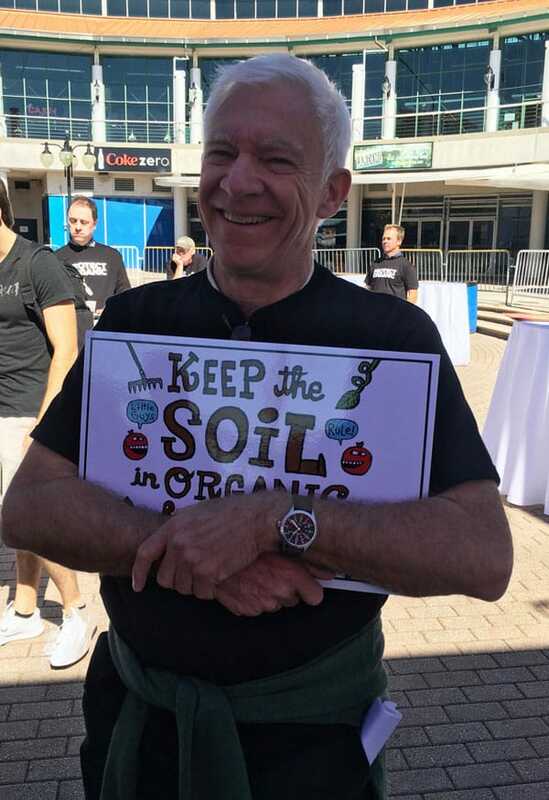 3:36PM CT: Davey Miskell of Miskell’s Premium Organics says the “keep the soil in organic” rallies are farmer driven. It’s too bad only a few NOSB members showed up. He showed a rolling video of all the organic farm rallies across the country. 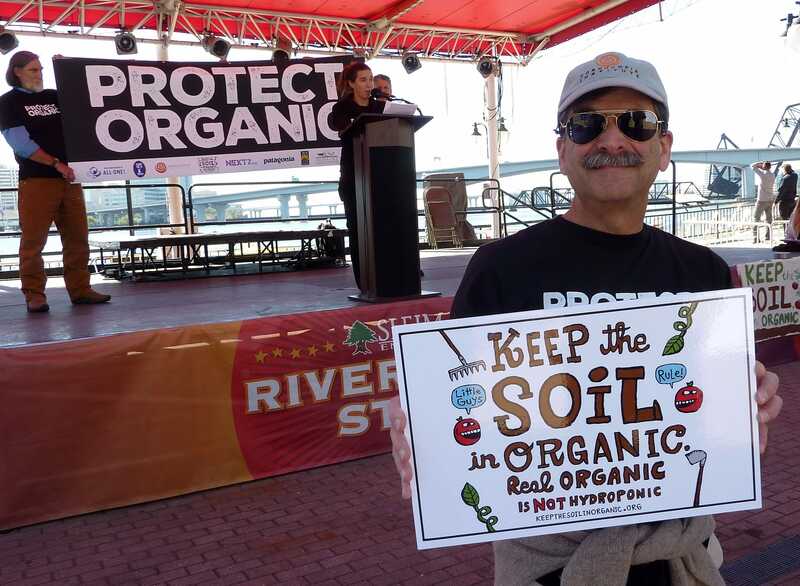 3:18PM CT: Both small and large growers testify in support of keeping organic in the soil in the ground. Dave Chapman of Long Wind Farm testifies with visual aids. His display uses a pot, Gatorade (to represent liquid fertility), and string (to represent the fertility water delivery systems). This topic is really quite simple, he says. Container production by Driscoll’s and Wholesum Harvest is hydroponic. This is not complicated. 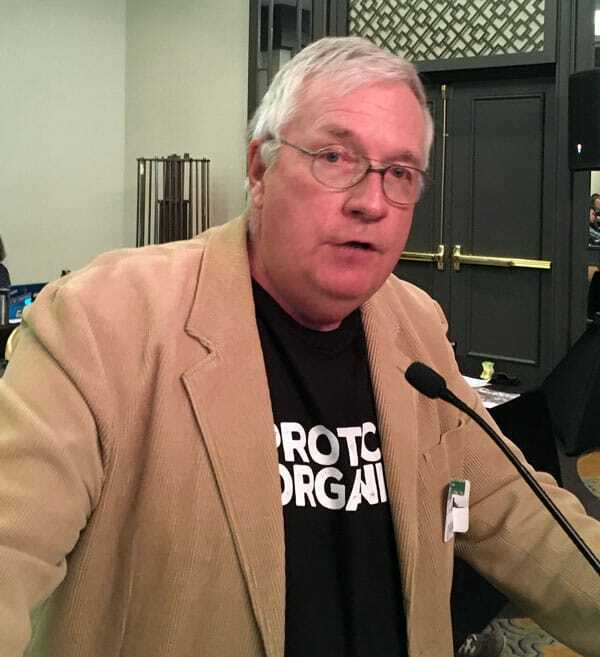 Gerald Davis (former NOSB member) of Grimway testifies that organic is in the soil. It is well known that feeding plants liquid nutrients creates pest problems – insect and disease. The compromise container proposal is a compromise and he highly doubts that it can be implemented. Plants in containers require constant liquid feed. 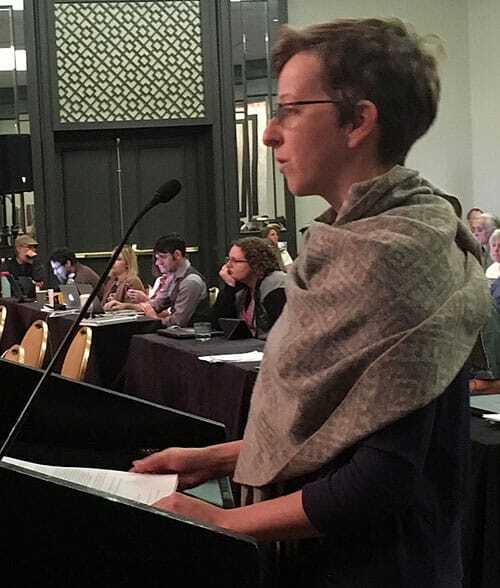 2:54PM CT: Jo Ann Baumgartner, Wild Farm Alliance, requests that the proposal to “reduce the incentive to convert wildlands to organic production” be sent back to subcommittee in order to better strengthen the definition of wildlands. Read Cornucopia’s comments. 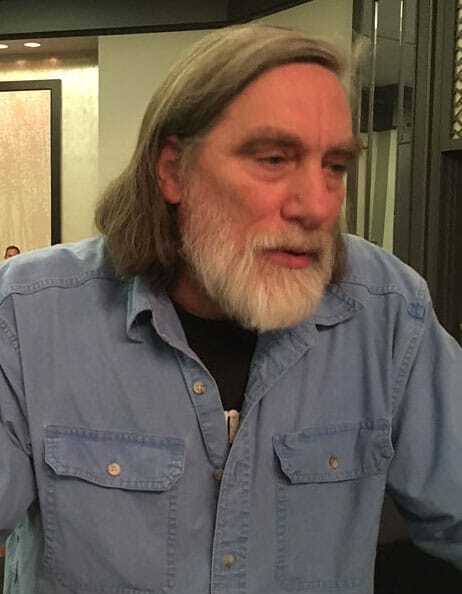 2:45PM CT: Jim Fullmer of the biodynamic Demeter Association: We must farm within our fragile earth’s interconnected systems, requiring soil. 2:19PM CT: Esteban Macias is a container grower that is 8% organic. He uses fish meal and soybean meal for feeding his plants. He is not in support of the hydroponic container proposal because the requirement that 50% of the fertility be in the container before planting would not work. The crops subcommittee set this requirement to require larger containers with soil rather than only using off-farm nutrient inputs. 11:17AM CT: Farmers and urban allies heading to a rally for keeping soil as the center of organic crop production as the NOSB takes its lunch break. Panel members say cross-departmental information technology is needed. This can be accomplished through the International Trade Data System and Automated Commercial Environment, a coordination electronic system between 47 different government agencies. Communication is needed between four USDA participants: AMS, APHIS, FSIS, and FAS. 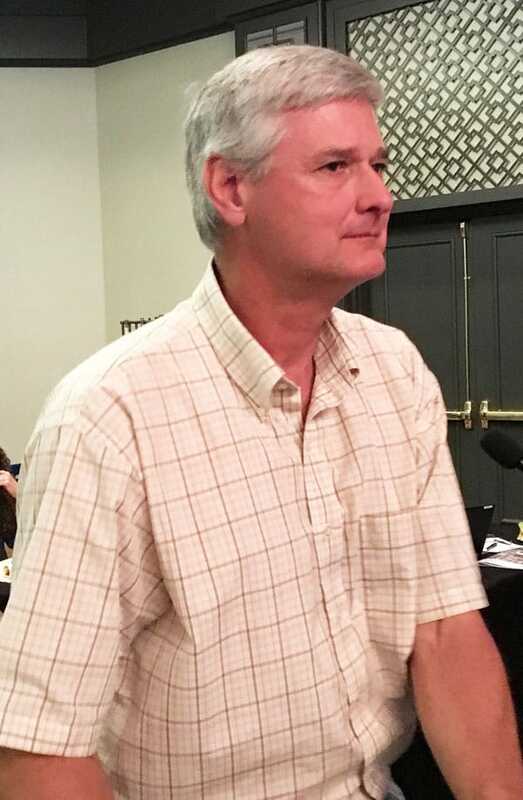 9:03AM CT: NOSB member Francis Thicke (organic farmer, environmental seat) asked NOP’s Jennifer Tucker how an announced inspection of the Aurora Dairy closes a recent complaint, especially since it is so easy to let the cows out to correspond with the paperwork when you know the NOP is coming. 8:39AM CT: NOP summation on import fraud: More paperwork will solve the problem. Cornucopia: Inspections and testing, get your boots dirty! 1. AMS should publicize the differences with equivalency agreements. 2. NOP import certificate should be required for all imports (it is not currently). 3. Customs and Border Protection at the border has a lot of authority at the border that the NOP does not. ACE system (system tracking products coming into the U.S.) does not currently hold import certificates, but it should. A “message set” allows ACE system to accept and store organic certificates. OIG recommends AMS and CBP work together and use NOP staff to make sure that certificates are valid. Cornucopia has filed a rulemaking petition to strengthen NOP import practices. 8:07AM CT: Fall meeting of the National Organic Standards Board (NOSB) meeting begins in Jacksonville, FL, with the NOSB members and National Organic Program (NOP) staff introducing themselves. Jennifer Tucker is sitting in former NOP director Miles McEvoy’s place next to the chair of the NOSB. Dr. Ruihong Guo is introduced at the meeting as the interim director of the NOP (she is not present).